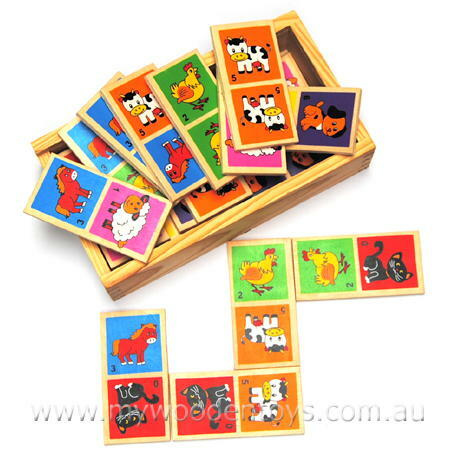 Simple Wooden Animal Dominoes are a colourful set of wooden tiles decorated with animals and numbers. This set contains 28 pieces decorated with six types of animal and numbers upto six. The animal are a chicken, dog, sheep, cat, cow and pig and they are painted directly onto the wooden tiles so there are no stickers to peel off. This game can be played as a traditional game of dominoes or as a simple sorting and counting game. The whole set packs into a sturdy wooden box with a perspex sliding lid. We like this because: "A lovely versatile toy"